I have not blogged in ages, I seem to procrastinate and so I have numerous half stories and hundreds of photos in my computer. Well Lakshmi Bhavan was one of my Friday sojourns with my friend Selvi. She wanted Chinoz at Bangsar Shopping Centre but I said I wanted something Indian, big difference, but the body knows what it wants sometimes. So at 10 am, there I was in the restaurant. Now last visit in December, they were vegetarian, but this time I noticed they also sold meat. I guess it is fine, since Saravana Bhawan is just a few shops down. This is another calamity in Malaysia, same shops selling almost same foods all in a row. Why I never understand. 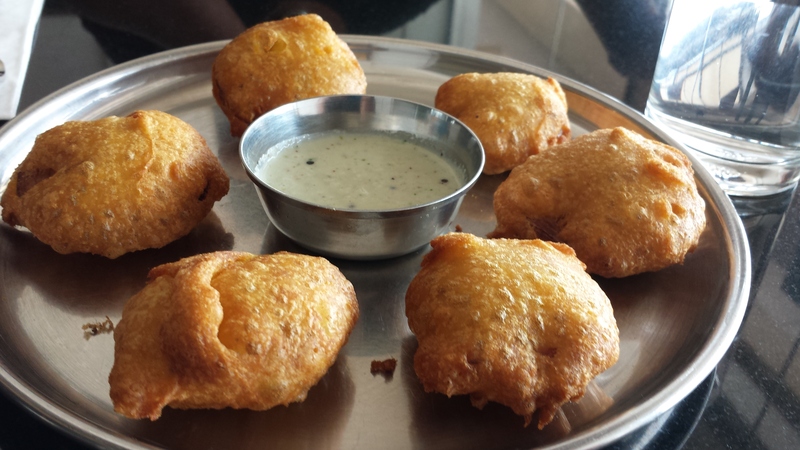 Anyhow Lakshmi delivered the goods and it is more relaxing then other Indian places which are usually noisy and boisterous and Saravana is never known for a place to relax and chat. Lakshmi on the other hand is sheer relaxation and slow paced and we actually sat and chatted for three hours the last time. So we ordered. The first was Onion Bhaji. I half didn’t know what to expect because in my mind I thought it would be minced onions all bhajied up much like our Malaysian Cucur Bawang. 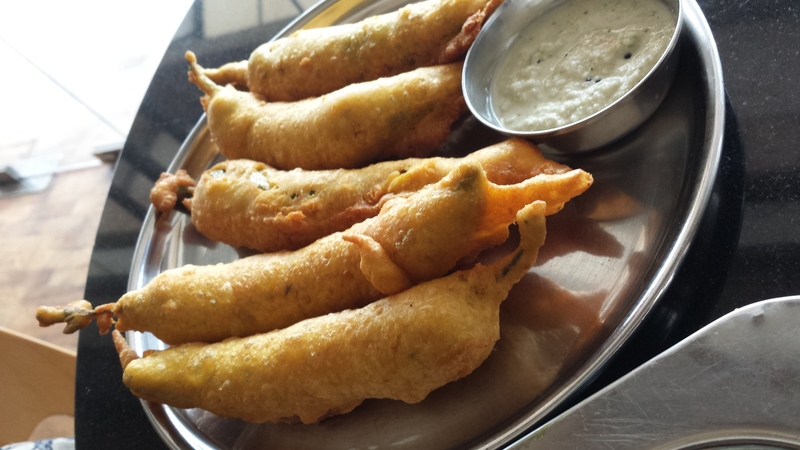 So knowledgeable I am about Indian food, I was quite taken aback to see a kind of thickish chion slice in the middle of each Bhaji that was served with I feel a little too little Coconut Chutney. Expecting to eat a really raw onion, I was wrong. It was cooked at the right temperature and the amount of time that the onion still looked fresh and yet was cooked right through. 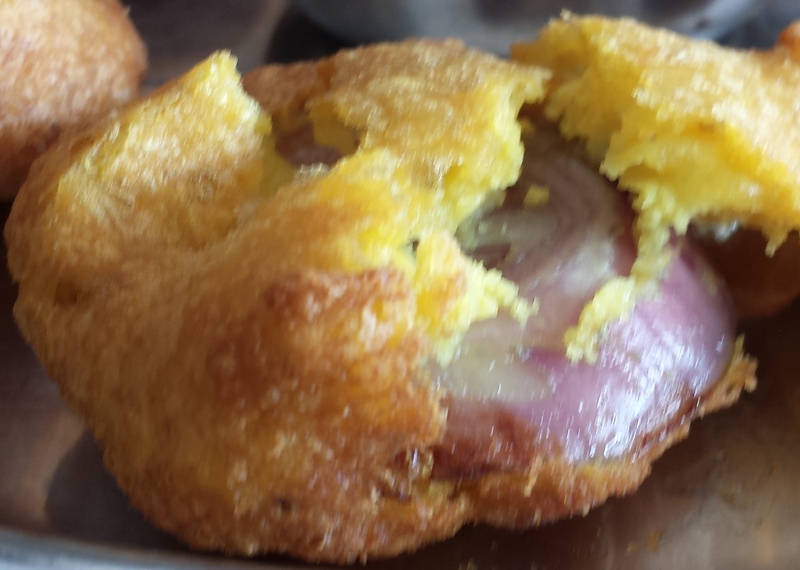 It was a burst of flavor amidst the rather powdery tasting bhaji batter, but it complemented each other well. Somehow, I feel the onions could have been smaller so the flavor would explode in your mouth when you take the first bite. I doubt children would like this because of the size of the onion. 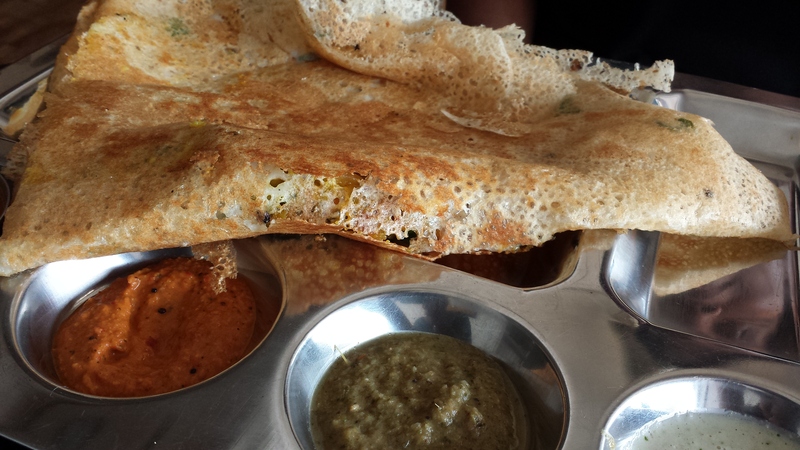 Then our Rawa Masala Dosa came. I have always had Rawa Dosa but never Rawa Masala Dosa. Now Selvi had a story where she ate Masala Dosa at a restaurant a few shops down, no names mentioned and the filling was stone cold. So she was half expecting that till we took a mouthful and frankly speaking I never saw Selvi eat like that before. It was either she was really hungry or it was damn nice. I believe it was the latter. The crispiness of the Dosa was still maintained even though we ate the Onion Bhaji first. And the filling was extremely nice. It was just what the doctor ordered, for two people who have had to put up with the haze, and water situation and all the other problems our country is facing at the moment. We just polished the plate. Next was out Bhaturas. 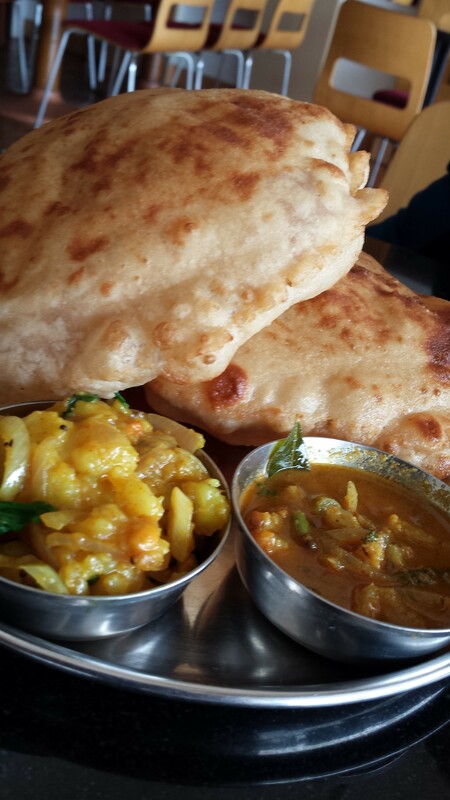 Now I do make quite a good Bhatura, but I am ashamed to say this one was very nice as well. It was not oily, yet if was fluffy and had a nice rich taste to it. No substitutions of a cheaper flour and the potato curry or Potato Sambar was truly delightful. It complemented the Bhaturas very well. I wish I could have had more potato curry actually. The Dhall Curry was very tasty as well, not the thick kind I make, but it went well and as for me, I like my Dhall Curry as a soup so I would eat it just like that…which I did. The atmosphere of Lakshmi Bhavan is not intrusive. What I do not like is waiters coming to sell their curries and all and if you were to ask them something, they’d look at you blankly. This does not happen here. The waiter is presentable and well spoken and he will even tell you not to order this and that if he feels the food might taste the same. That is what I like when I go out to eat. Selvi decided to order the Chilly Bhajis. Once again I thought it would be slices of chilly cooked in a vegetable puff kind of way. Well as you can see I was once again wrong. I think my lack of knowledge on Indian Food is quite shocking and embarrassing. I should do something about it. Now first bite, this was simply wonderful. Yes there was a bit of spiciness, but the bhaji mix complemented the chilly very well. Even better then the onion one I feel. Selvi and I also learnt that, chilly is spicier at the stem rather than the tip. So there you go, you learn something new all the time. The we had Mini Idly (Yours truly pronounced it Italy and got looks of death). 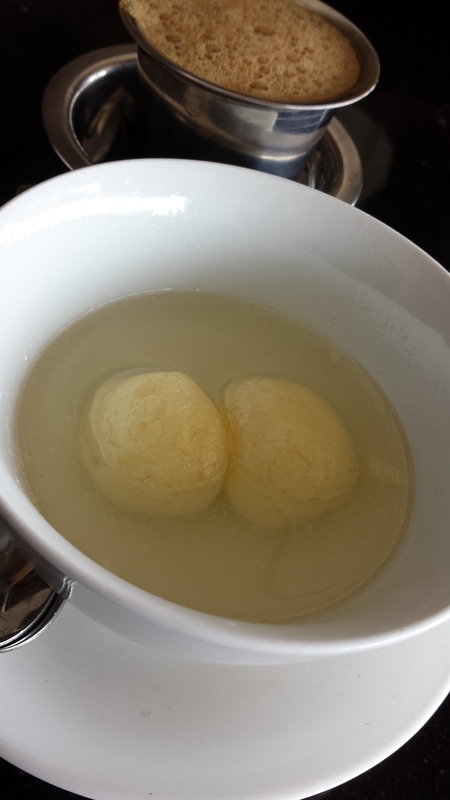 These were mini sized Idly in a bowl with the same Dhall that came with the Bhatura. It was nice. Frankly I do not like sauce all over my food so I would have preferred it separate. 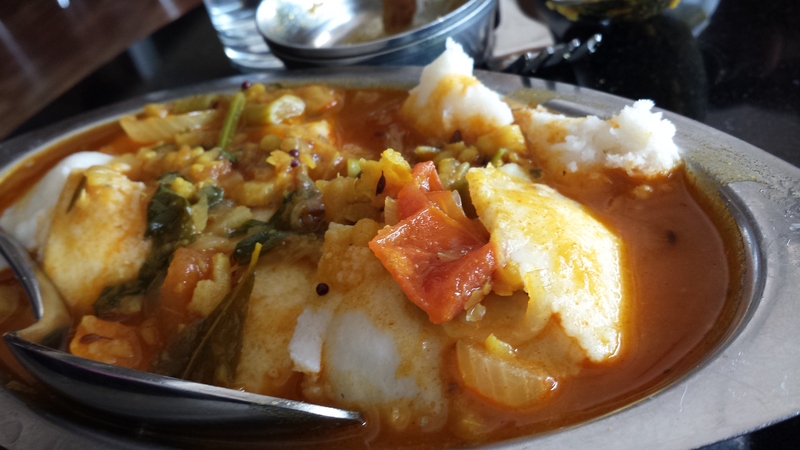 The tanginess of the gravy with its vegetables as well as the tanginess from the Idly was not over powering for some reason. If I ordered it again, I would tell them to separate the gravy. I am sure their other desserts are fine though. While lazily sipping our Masala Tea, I am sure we could have stayed a lot longer and ordered more stuff if I had not had to rush home for an order. I think finding an Indian Restaurant that is quiet and clean, and also enables one to sit and talk is quite rare. Service wise, It is pretty good, except the waiter could be a tad bit more on the ball. His gentility was very much obliged, but sometimes, to get his attention, one had to do a song and a dance so to speak. If I lived in the Bangsar area, I would certainly visit Lakshmi Bhavan a lot more, just to sit there and absorb the atmosphere and of course the nice food. I will certainly go there again.